The definition of a posse is “a body of men, typically armed, summoned by a sheriff to enforce the law” Posses were known to be used by the county sheriffs in the frontier towns to help them track down fugitives or to aid the one man Sheriff’s office in the enforcement of law in small towns. In the west, they were highly used to fend off or capture train and stagecoach robbers. In the early years of the U.S. Marshals Service, many offices lacked the financial support of the government to hire enough deputies to be enumerators, collect taxes, carry out Federal court orders and generally enforce the Federal laws. In these instances, the U.S. Marshal called upon citizens of the community and swore them in as Special Deputy U.S. Marshals and they were given the temporary authority to carry out the needed law enforcement duties. There were temporary duties and usually only lasted as long as the specific job called for. The modern day posses were formed in 1987 to help honor the 200th Bicentennial celebration of the U.S. Marshals Service. These posses consisted of various equestrian groups. These riders represent the U.S. Marshals Service in parades and other gatherings in the areas. The following are a few of the posses that were created. President George Washington appointed the first 13 United States Marshal two hundred years ago. As the nation expanded westward in the 1880's, Marshals were appointed in new states and territories, carrying with them the full law enforcement authority of the Federal government. They represented the power of the Federal court and the rule of law. The reality and myth surrounding the Wild West popularized the role of United States Marshals in the national imagination. Bat Masterson, Wild Bill Hickok, and Wyatt and Virgil Earp all worked for the United States Marshals, as did hundreds of other lawmen who helped establish law and order on America's frontier. There efforts were among many significant contributions United States Marshals have made in 200 years of service. The job remains essentially the same today. Marshals and their deputies secure the Federal Courts and protect judges and other court officers, track down and arrest fugitives from justice, transport prisoners, manage hundreds of millions of dollars in assets seized from criminals, enforce the orders of courts, and perform many other law enforcement tasks essential to the operation of the Federal justice system. The United States Marshals Posse was formed to commemorate this history. The posse is the first duly sworn Posse in almost 100 years and is calling to attention the traditions of the United States Marshals. In the winter of 1986, at the direction of Stanley E. Morris, Director of the United States Marshals Service, Chief Deputy Marshal Peyton G. Bear was given the responsibility to form a United States Marshals Posse to commemorate the 200th Anniversary of the Marshals Service. Peyton G. Bear contacted members of various parade mounted groups to form a Steering Committee. The steering Committee was composed of: Jack W. Brown, William R. Cleveland, James Olivas, Howard Tait, and Norbert W. Dean as Chairman. In a General Meeting of August 19, 1987, the Bylaws were approved and the following officers were elected; President Norb Dean; Vice President Bill Cleveland; Secretary/Treasurer Joe Indelicate; and members at large: Jack Brown, Jim Olivas, Howard Tail. A non - profit corporation was established and insurance for the Posse was placed. On August 24, 1987, Director Stanley E. Morris, swore in the original members, including James Arness, Gene Autry, and Monte Hale, at Angels Stadium in Anaheim, California. On October 31, 1987 the Posse appeared in its first official parade in Carson City, Nevada, with thirty - one riders. 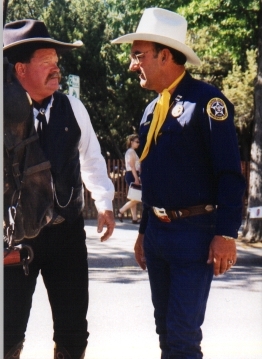 The Posse was supported by many Marshals and Chief Deputy Marshals from California, Nevada and Oklahoma. By the end of January 1988, the Posse had accepted over 100 Charter Members. One year later in January 1989, the Posse had officially appeared: Hollywood Christmas Parade, Cheyenne Frontier Days, Pasadena Tournament of Roses Parade, and the Inaugural Parade in Washington, D.C., honoring President George Bush. 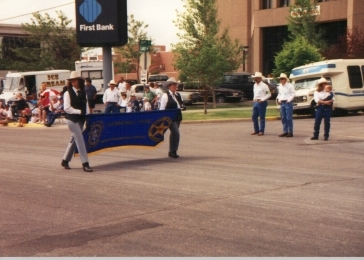 As of February 1990 the Posse had appeared in over thirty-two parades and events. The Posse membership is still growing, and at this time we have 144 members. The United States Marshals Posse is continuing to publicize and educate the public of the United States Marshals Service. With National recognition, our elite Posse has received request to appear in parades all over the country, including Hawaii and Canada. 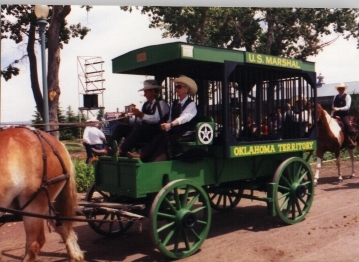 The objectives of the United States Marshals Posse shall be to cooperate with the United States Marshals in rendering such non-law enforcement assistance to the Marshals Service as may be required when called upon; and in publicizing the United States Marshals Service ; and to promote good horsemanship among the members and public at large, particularly worthy groups, and to promote among the members social well being and good fellowship. The first U.S. Marshals Posses were formed in 1987 in preparation for the Marshals Service Bicentennial celebration. There are currently seven Posses nationwide, all of which are in the Western United States, that are supported by the U.S. Marshals Service. The U.S. Marshals Posse is a private organization whose purpose is to provide non-law enforcement assistance to the United States Marshals Service. These honorary ceremonial posses symbolize the tradition of citizen participation in law enforcement and they offer to audiences a positive Marshals Service image and a sense of history. Each posse establishes its own horse, tack and uniform requirements and members pay their own expenses. The United States Marshals Posse is private in nature and they are limited as to the activities in which they may engage in while representing the U.S. Marshals Service. 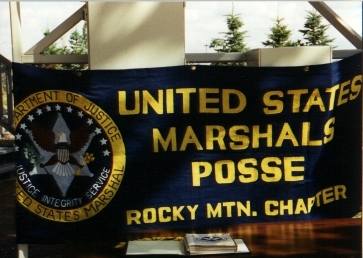 The Rocky Mountain Chapter of the United States Marshals Posse was formed in the Denver area in January 1992. The purpose of which is to promote good horsemanship among the members and the public, to publicize the activities of the U.S. Marshals Service, and to promote social well being and good fellowship among the members. This Posse's current membership is front all over the Front Range and contains a wide variety of horse breeds and riding abilities. Since this Posse caters to the needs of the recreational rider, matching horses and tack are not the main focus as with some of the other Posses. The Rocky Mountain Chapter is concentrating its efforts in promoting good horsemanship in the community and providing a positive image of the United States Marshals Service. As part of the Bicentennial anniversary of the United States Marshals Service, Posses have been formed in Oklahoma, California, Arizona and Wyoming. The U.S. Marshals Posse is a private Organization horning the U.S. Marshals Service which had it's first 13 Marshals appointed by President George Washington in 1789. These Posse Members are not employees of the U.S. Marshals Service and have NO Law Enforcement authority. Posse Members are primarily equestrians who sit tall in the saddle, proudly promoting the nation's oldest law enforcement agency. The objective of the Posse shall be to cooperate with the U.S. Marshals Service in rendering such Non-Law enforcement assistance as may be required when called upon and to promote the U.S. Marshals Service at large. We have participated in parades, dedications, trail rides, and provided local support and assistance in fund raising for other non profit organizations. We are currently working on forming a mounted search and rescue unit, for the State of Oklahoma. Some Posse members are lending their help and support to the construction of the Historic United States Marshals Memorial, now being built in Oklahoma City.